Get 20% OFF Deluxe for 2019 is now 20% off on sale at HRblock.com. This offer was just given to us exclusively from the folks at the H&R Block – Save 20% on Deluxe 2019 Online or any of the latest online versions of H&R Block software. Your order of Deluxe will also include up to 5 free federal e-files, 1 state download, free personal tax advice, and access to DeductionPro. Because this is an instant coupon, no other codes are necessary at checkout. Offer expires at the end of the month. Get 30% Get 30% off on H&R Block Deluxe Download. If you prefer to work on your tax return on your local computer (as opposed to online), you can get the download version of TurboTax now on sale for 30% off the list price. That drops the sale price from $54.95 to $35.72. Follow the like to learn more about your options and to take advantage of the sale. Now on Sale Find H&R Block At Home Deluxe at Amazon. Choose from either the PC or Mac version at Amazon and save! You can also choose to get the download version which lets you download and install your order immediately after checkout (download size is about 48.99 MB so only a 4 minute download time or so depending on your internet connection). There is no promo code required as the sale price will be automatically reflected in your order when you follow the above discount link. Sale prices will vary so see Amazon for more details. Try it Free Try H&R Block At Home Deluxe Online for free. 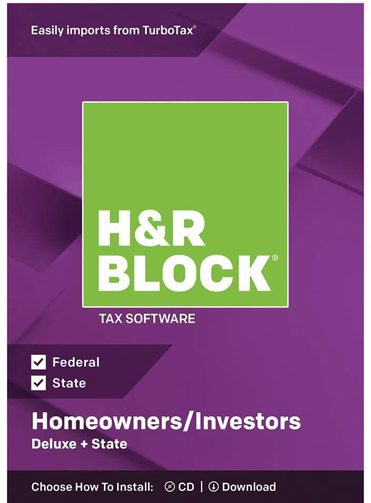 If you’re not sure if H&R Block At Home tax software is right for you or if you are considering switching from TurboTax (maybe because their prices have gotten so high) then you have the ability to try H&R Block free at hrblock.com. Just select the online version that fits your tax needs the best and you can start working on your return completely for free. Although you won’t be able to file without buying a copy, you’ll be able to get a pretty good idea of how the software works. This is one the most popular versions of H&R Block mainly because it applies to the broadest group of taxpayers. This version is designed to serve homeowners, those who make donations, or individuals who contribute to Health Savings Accounts. Naturally, it also applies to those who hold jobs and receive W-2 at the end of the year. Homeowners can rely on help with filling out Schedule A. The software provides step-by-step guidance on how to maximize all the deductions related to home mortgage interest and real estate taxes. Keeping track of donations isn’t the easiest thing in the world because we don’t do it very often. On top of that, we have to fairly estimate the amount of donated goods. In order to have that information handy and centralized, H&R Block has introduced DeductionPro. There have been many improvements made to the H&R Block product over the years. The biggest theme is automation through which you save time and minimize errors. You can now take a picture of your W-2 and import it to your return. Rather than entering number manually and risking errors, software can import that information and populate the required fields. Another way to automate the reporting is to import your prior year tax returns. The easiest option is when you filed taxes with H&R Block in the prior year(s). The software carries forward prior information eliminating the need to type in all the personal details. But even if you filed taxes with a different institution, as long as you have a pdf copy of that return, you can import it from your desktop and update any changes you experienced in the prior year. Calculation of Earned Income Tax Credit (EITC). Ability to import the following forms: 1095-A, 1098, 1098-E, 1098-T, 1099-B, 1099-DIV, 1099-INT, 1099-R.
Technical support by phone or chat and self-help via help center. One other benefit of filing tax returns with H&R Block online is that it will save the returns for you. If you ever need to access your old returns, you have up to six years to retrieve the information from your account on MyBlock. You can file your taxes with the peace of mind of H&R Block Guarantees. One is that you will receive the maximum possible refund. Deluxe Online will go through all the deductions and credits you are entitled to. The second is the accuracy of all the calculations. In case there is a discrepancy, you will receive your money back. And the third is help in case of an audit. If you receive a letter from the IRS to address any of the areas of your return, H&R Block will help you respond to that notice at no additional charge.